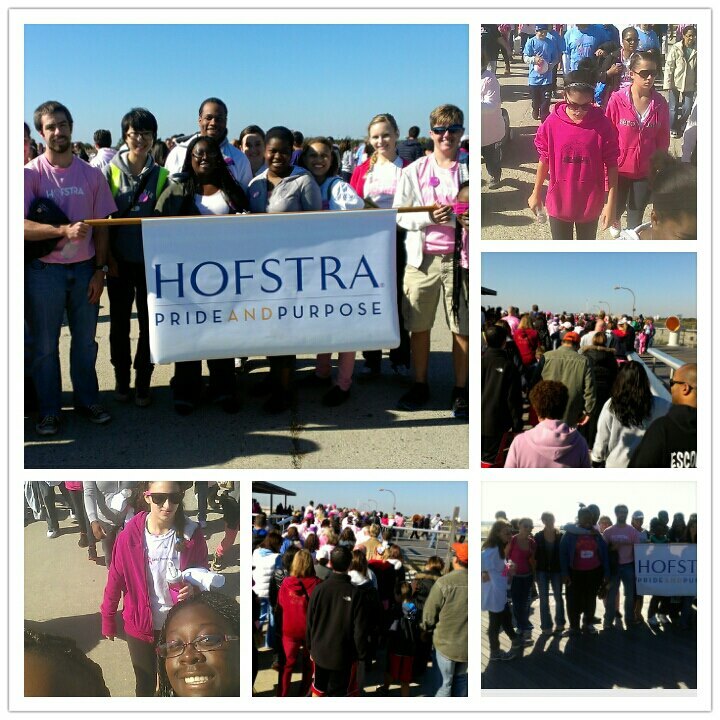 Hofstra Student Life: Hofstra Makes Strides Against Breast Cancer! 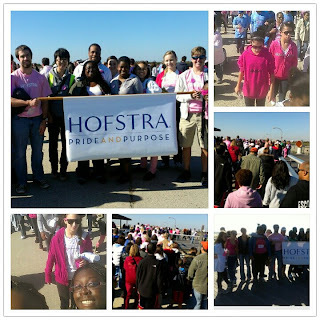 Yesterday we put on our walking sneakers, the best combination of pink wear we could find, and gathered as much Hofstra PRIDE as possible as we headed to the Jones Beach Boardwalk for the annual American Cancer Society’s Making Strides Against Breast Cancer Walk. It was a beautiful morning, perfect for walking alongside other committed community members, survivors, caretakers and their families to raise awareness and money to help fight breast cancer. According to the American Cancer Society, approximately 64,000 people attended the walk at Jones Beach, all of whom raised over $3 million dollars in donations! Hofstra students gathered behind the Office of Student Leadership and Activities’ banner that read “Hofstra University; Pride and Purpose” and chanted Hofstra’s name as passerby walkers applauded Hofstra students for walking. In total, about 275 Hofstra students participated in fundraising, volunteering, and walking, raising over $8600 for the cause! A feat the entire Hofstra community can be proud of! The Hofstra team that raised the most funds and had the most members was the Hofstra Physician Assistant Program with 56 team members raising over $2530! According to the American Cancer Society’s Making Strides Against Breast Cancer website, Hofstra’s Dance Department came in a close second with 22 members raising over $2507 and the Discovery Club with 10 members coming in third with $1325. We would also like to give an honorable mention to Delta Phi Epsilon who had 34 registered members and Alpha Phi with 32 members. OSLA would like to say great job to all the teams who participated! It was an inspiring experience for all those who attended and we know that the Hofstra community will continue to work towards fighting breast cancer until there is a cure.